In gene editing, the kindest cut may be no cut at all. This possibility was explored by researchers working with peptide nucleic acids (PNAs), synthetic molecules that combine a protein-like backbone with the nucleobases found in DNA and RNA. When deployed by researchers based at Carnegie Mellon University and Yale University, PNAs succeeded in correcting mutations responsible for the blood disorder β-thalassemia—and not just in cell cultures, but in live mice. The researchers described their work in Nature Communications, in an article (“In Vivo Correction of Anaemia in β-Thalassemic Mice by γPNA-Mediated Gene Editing with Nanoparticle Delivery”) that appeared October 26. This article emphasized that unlike the CRISPR gene-editing system, the PNA system did not incorporate any sort of molecular scissors. Instead, it consisted of a component that opens up double-stranded DNA, donor DNA that binds to faulty DNA in the vicinity, and another component that coaxes the cell’s own DNA-repair machinery to alter targeted genes. Encouragingly, the PNA system was observed to significantly decrease unwanted, off-target gene mutations. The “triplex” noted in the quote above refers to the PNA-DNA-PNA triple helix that forms when PNA binds to target DNA. The triplex, which leaves a displaced DNA strand, induces DNA repair and thereby catalyzes genome editing. In the current study, the PNA was designed to target the malfunctioning gene in β-thalassemia, a blood disorder that reduces the production of hemoglobin. The PNA was packaged within a nanoparticle delivery system, which also contained a donor strand of DNA encoding the sequence for a functional hemoglobin subunit β, and a stem cell factor that enhances gene editing. Besides noting this improvement, the researchers emphasized that their PNA system circumvented a couple of problems seen with CRISPR gene editing. First, the enzymes in the CRISPR system are large and therefore difficult to administer directly to living animals, so scientists typically remove the cells, treat them in the lab, and then put them back into the body. Second, once inside a cell, these enzymes can indiscriminately cut DNA at sites other than the original gene target. In contrast, the PNA system is compact and fits readily within biocompatible nanoparticles for intravenous delivery. Also, the PNA system does not include any of its own cutting components and so may be less prone to errant cutting—and the resulting off-target effects. In summary, the current work was possible because of two key advances. The first is the PNA itself, which was designed to have a polyethylene glycol group on a side chain. 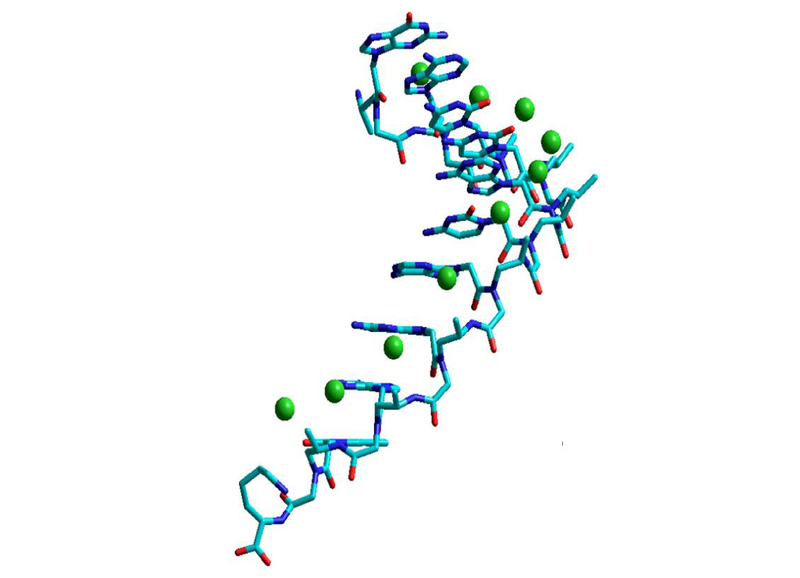 This innovation made the PNA in the current study, γPNA, water-soluble and biocompatible, properties that kept it from binding to proteins and other biomolecules in a nonspecific manner. Additionally, the specific stereochemistry of the polyethylene glycol group preorganized the PNA into a right-handed helical motif, making it bind to DNA more readily. The second advance was the finding that the addition of the stem cell factor promotes increased gene editing.